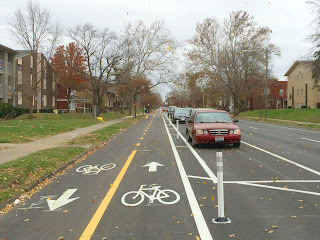 Blogger's Note: This is the start of a new series on Bike Commuting in Columbus - Commuting 101. While I've marked posts with that before, the goal here is to provide the basic info you need to get on your bike and get commuting! As we get closer to the beginning of spring, more people are taking to the roads and enjoying the world of cycling for transportation. And there are many more who would love to do so, only they don't have that most basic of items necessary for riding to work: a bicycle. And many more have an old bicycle kicking around in the basement, garage, storage cell, what have you, but they haven't ridden it in years. So let's discuss those two possibilities. First, getting a "new" bike, and second, getting the old one ready to ride. First, a good solid commuter/transportation bike is NOT always a recreational road bike. The same bikes you see Lance Armstrong and his compatriots barreling along the French countryside on will not make good commuter bikes for most people. Granted, if you're a current road bike racer, touring cyclist, or other recreational cyclist, then riding your current bike is probably going to be just fine. But there are some caveats to that and I'll get to those later. Now keep in mind that all these suggestions below are based purely on my personal observations through three and a half years of commuter cycling, so you may disagree. If you do, let me know why in the comments below! 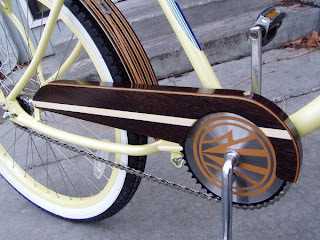 A commuter bike is simple to operate, comfortable to ride, and sturdy. It can handle some cargo. It's set up to get on and go. Let's start with simple to operate. I recommend upright or flat handlebars for commuter riding. Again, if you're used to something else, then go with it. But I've found that people who are sitting upright with those types of handlebars are more able to see what's around them, and also their turning signals (which, you'll recall, are done with the arms on a bike) are more easily seen. Also, sitting upright is more comfortable. Brakes and gear-shift levers can sometimes tricky to operate on a bike, particularly for new riders. Brakes should be located where they are immediately accessible - preferably right on the handlebar in front of your hand grips for quick access in case of the need for a quick stop. 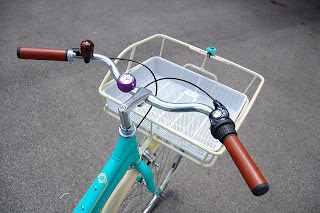 The locations of gear shift levers can be on the handlebars, the top tube, any number of places. Some folks like them to be down on the stem or the head tube, because they're more easily accessible when down in the racer's crouch. But for commuters, I suggest getting some handlebar-mounted gear shift levers - preferably ones that can be operated by the thumb as you're riding. There are a couple of different models of these, and a good shop owner can show them to you. The handlebar image above shows twist gear shifts - a good option for the commuter because they're literally at your fingertips and you can look down and see the number of the gear you're using. Moving down the bike, I suggest that the bike have a chain guard. This is that shell around the chain near the pedal and going back to the rear cassette that keeps your pants leg from getting all greasy. Having this will allow you to ride any time without having to stuff your pant leg into your sock, and it's just more convenient. Don't let this be a show-stopper, though. While many American bikes are starting to sport chain guards for the reasons I describe, it's still not considered standard gear on a bike. If you can find a bike that has a belt drive instead of a chain, you won't need to worry about this - belt drives don't need the lubrication to keep them running properly that a chain does, so the grease factor isn't an issue. Tire width is another one of those things that is a matter of opinion. Simply put, narrower tires are faster, no doubt about that. Wider tires are slower. 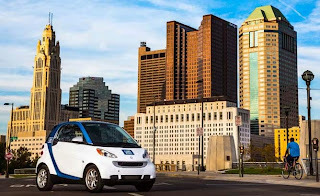 But wider tires are also better for dealing with city streets because they are less likely to get caught in cracks in the pavement, sewer grates, and the other many road hazards you may come across. I recommend getting tires that are at least 1.5 inches wide. They'll handle those aforementioned hazards better. I personally ride with 1.95" wide tires and I never have problems with cracks, etc. And finally, make sure you have a comfortable saddle. Sitting upright on the commuter bike, you'll need a wider saddle to be comfortable on your ride. Of course, everyone's built differently, so my only advice is to take the time to find one that really feels comfortable to you. So where should you get your bike? That's easy: at a bike shop. PLEASE avoid getting your bikes as Wal-Mart, Target, etc. While it's possible you could get a good bike there, you'll get some good attention from a bike shop owner who specializes in what you're looking for. A good bike shop will let you test-ride bikes to see how you like them and how they fit you. Make sure you tell the salesperson that you're looking for a commuter bike - something for simple transportation, and can take things like a rear rack and panniers, etc. ASK QUESTIONS. If you feel the salesperson is moving in the wrong direction for your bike needs, ask them questions about your concerns. If the salesperson starts talking about things like bike weight, then you may have to re-focus them a bit. Bike weight really isn't a concern for commuter cyclists - in fact, a sturdier, heavier bike is a good thing for the commuter. Luckily, with more people bike commuting, salespeople are getting better at finding the bikes that are best for commuters. You can find bikes at second-hand places and garage sales, too. Be more careful here. Some second-hand shops are good, some not so good. Bikes don't devalue nearly as much as cars do, though, so an older bike is perfectly good solution to your problem. And the same recommendations apply to second-hand shop salesmen as they do to new bike shop salesmen. Let them know what you want. Sometimes, the second-hand shop guys know even MORE than the new shop guys because they've renovated the bikes in their shop personally! Let's say, though, that you already have a bike in the garage. You haven't ridden it in years, though, and you aren't sure about all the parts on it. Instead of spending the money on a new bike, take that old bike into your local bike shop and get it tuned up and checked out by a professional bike mechanic. The mechanic will get it lubed and cleaned, let you know if it's safe to ride, what parts might need to be replaced, and get the bike out and on the road. Usually, this can be done for much less than the price of a new bike - even if parts need to be replaced. As I mentioned before, bikes don't break down as much as cars do - a good bike frame, if made properly before, is a tough thing. Tomorrow, we'll talk a bit about equipment you'll want to add to your bike that might not be included. Questions? Comments? Feel free to chime in and start a conversation here! Good, commonsense advice for the type of bike needed to ride around town in work clothes with a laptop and lunch! The wrong style of bike could really make the difference between a great way to travel on nice days and a total dangerous nightmare. Hah! That bike would be just about perfect, wouldn't it? I have a Specialized Expedition that I was given back in 2006 - for me, it's perfect except for the lack of chain guard (unlike your Schwinn). My goal with a bike is to have something that I have to do nearly NOTHING to get going. I don't want to change clothes, I don't want to have to pack up a bunch of stuff that I wouldn't pack up anyway, that sort of thing. And I want it to work when I need it, period. All the things I mentioned in this article help with that. Other than 2 summers ago when the front brake cable snapped (going downhill, of course), the only work my bike needs is air in the tires every 2 weeks. Nice and easy! That is entirely awesome. Do you do your own maintenance? Yes, but I wish I had bought a proper cable cutting tool. That hardened stuff wiped out a clipper before I taped it and used a hacksaw. My derailleur is so old that I am constantly tweaking it but cannot get it to center on all gears 1-5. Something is worn-out that I'll never figure out.